BT moves another freebie to social media platforms, to give viewers another way to sample BT Sport's content. Rugby Union magazine show Rugby Tonight will be regularly streamed for free online on Facebook and Twitter, targeting potential subscribers with an opportunity to sample the broadcaster’s show. 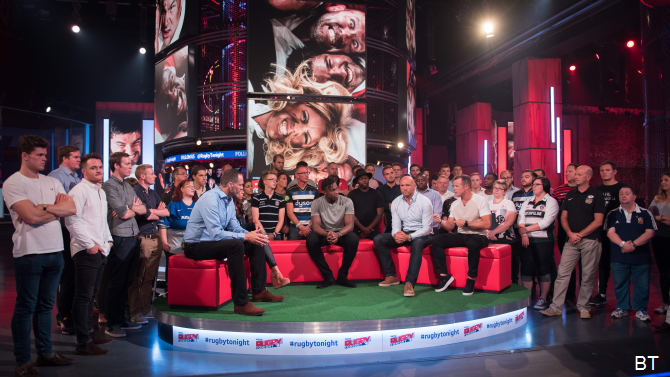 The weekly hour-long show will be shown in full on BT Sport's normal pay TV channels, with the first quarter also being streamed on BT Sport Rugby’s Facebook and Twitter feed. The first part of the programme will focus on questions and opinions from the social media platforms to some of the biggest names in rugby, and this will take place throughout the season. This season Rugby Tonight will see Craig Doyle, Martin Bayfield and Sarra Elgan all present the show alongside the BT Sport rugby team of experts that includes former international stars Ben Kay, Austin Healey, Ugo Monye, Brian O’Driscoll and Lawrence Dallaglio. Following an announcement earlier this month that BT Sport would stream its Saturday football results show on Twitter, the free taster of Rugby Tonight is a further departure from BT's use of its Freeview service BT Showcase, now in HD in some areas on channel 115, which was previously BT's main avenue of providing freebies to viewers. Since May, UK coverage of the Freeview service has been cut. BT also made last season’s UEFA Champions League and UEFA Europa League finals available on YouTube, the BT Sport website, BT Sport channels and the app. BT says such moves underlines its commitment "to make televised sport more accessible to fans". Free-to-air screenings of Aviva Premiership Rugby fixtures this season will appear on Channel 5. Previously, a selection of games was available terrestrially via Freeview on the now defunct BT Showcase service that used to be on channel 59.